MONTGOMERY, AL (WSFA ) - The initial line of strong to severe storms is pushing through parts of central and east Alabama now. Storms embedded in this line have the potential of producing damaging wind gusts up to 60 mph and hail. A second line is moving into western Alabama now, and that line has the ability of producing tornadoes, hail and damaging wind gusts as it moves east across Alabama. A Tornado Watch is in effect for much of central and west Alabama, and a Severe Thunderstorm Watch is in effect for many of the eastern counties of the state, where damaging wind is the main concern for the next few hours. 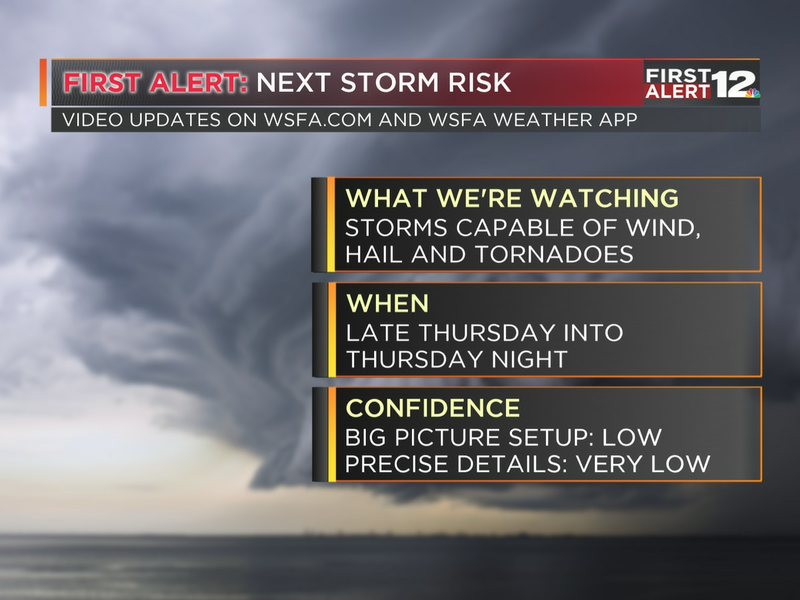 IMPORTANT TAKEAWAYS: It is critical you understand that no matter what threat level your county is under, ALL OF CENTRAL AND SOUTH ALABAMA has a risk for severe weather - including tornadoes. Our window of opportunity will continue through 6am Friday. Models now suggest storms will work into the Montgomery area around midnight, give or take. We’ll be closely monitoring the northward extent of a narrow corridor of instability. That will be a big factor in how things unfold. After midnight, most of the activity is now along and east of I-65. The greatest risk for severe weather by this point likely exists along and south of I-85. We can’t rule out a strong tornado or two. Much like last weekend, there is a large overnight presence to this setup. While that often helps keep instability under control, it provides the added issue of awareness when most are asleep. You must make sure you have multiple, reliable ways of hearing possible warnings BEFORE going to sleep Thursday night. Make sure something (or some things, plural), will wake you from your slumber. • Severe weather will be possible now through 6am Friday. • Our entire area stands at least some risk for severe weather. CAN YOU FIND WHERE YOU LIVE ON A MAP? Many people can’t, and it handcuffs us as we use maps on TV all the time. Take a minute and find where your county is. Find where your city is. We’re not asking you know know where every BBQ joint and gas station is (we have Josh Johnson for that), but having basic geographic knowledge of where you are located will help us help you. Friday is a raw day with scattered showers accompanying much cooler air. Temperatures Friday won’t get out of the 60s. 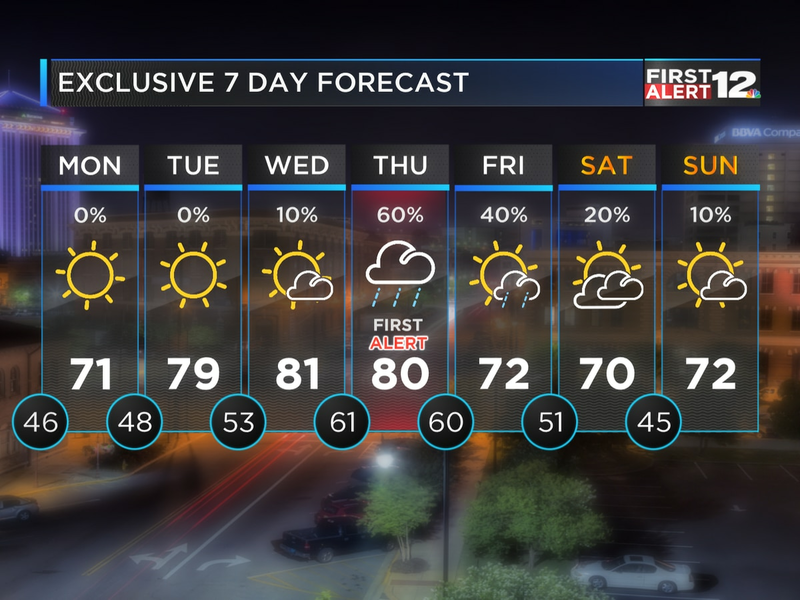 Sunshine returns this weekend will no weather issues are expected into Easter Sunday.